Is waste paper really ‘waste’ if it has a value? 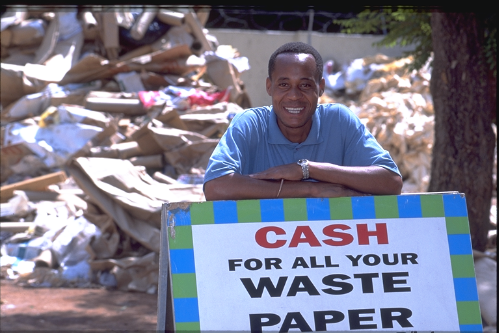 It’s a question that the Paper Recycling Association of South Africa (PRASA) often poses. The answer is no. “When we separate our recyclables from general rubbish, we will soon discover that there is treasure to be found in trash, says Ursula Henneberry, operations director for PRASA. Today a newspaper, tomorrow a cereal box. Paper and paper packaging is not waste but a valuable commodity. For manufacturers, recycled paper is an alternative fiber, with some 65% of recovered paper being used as raw material to produce corrugated boxes and boards, newspapers, tissue products, kitchen and industrial paper toweling, cereal boxes, soap cartons and moulded paper products like egg boxes – In other words, many many every-day items that millions of people use. PRASA’s member companies in the paper recovery, sorting, recycling and manufacturing sector operate a vast network of buy-back centres, which help to facilitate the trade of recovered paper. Many of these facilities offer walk-in, daily trade and more formal procurement arrangements. Around 37,000 people rely on recyclables for their daily bread. On any given day, and especially refuse collection day, you will be sure to notice a number of people with rickety trolleys checking wheelie bins and black bags for recyclable items. “Informal waste collectors can often be seen as a nuisance, especially when hauling overloaded trolleys along busy roads; but these people are making a living by recovering recyclables and selling them to buy-back centres,” explains Henneberry. The average waste collector can start without a cent in his or her pocket and end the day with enough money to buy food for the table or school shoes for their children. Not only does recycling provide economic opportunities for citizens from all walks of life, it ensures that valuable raw material does not end up in landfill where it becomes difficult if not impossible to retrieve, due to it being contaminated and unusable. Paper recycling also plays a big part in sustaining jobs – from the people who walk the streets collecting recyclables to bigger companies that employ people to recover, weigh and sort recyclables. Make a difference, sort your waste. Everyone uses paper in one way or another every day, from business documents to school reports, from cereal boxes to milk cartons and the ever-essential toilet roll cores. By keeping your paper recycling in a separate bag for your local waste collectors, you will save them the time and the health risk of digging through a week’s worth of wet and smelly waste. “Recyclable paper products should be kept clean and dry to ensure that the waste collector earns maximum value,” advises Henneberry. Rolling out water	Paper recycling. Simplified.